Balance control refers to the location of the CG of an aircraft. This is of primary importance to aircraft stability, which is a factor in flight safety. 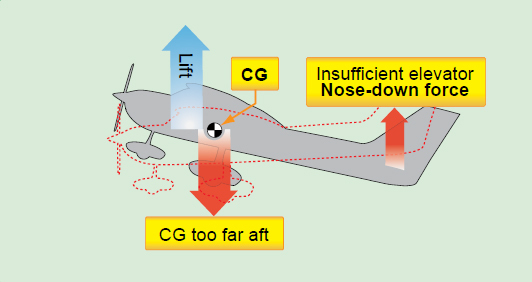 The CG is the point at which the total weight of the aircraft is assumed to be concentrated, and the CG must be located within specific limits for safe flight.Both lateral and longitudinal balance are important, but the prime concern is longitudinal balance; that is, the location of the CG along the longitudinal or lengthwise axis. Figure 1-1. Longitudinal forces acting on an airplane in flight. 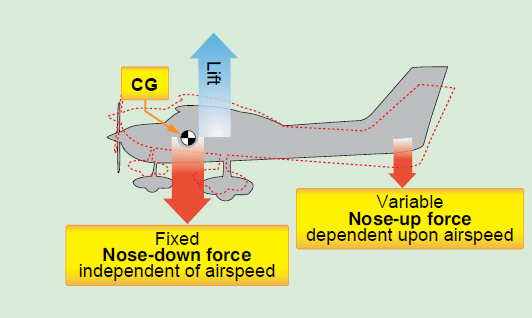 If a rising air current should cause the nose to pitch up, the airplane slows and the downward force on the tail decreases. The weight concentrated at the CG pulls the nose back down. If the nose should drop in flight,the airspeed increases and the increased downward tail load brings the nose back up to level flight. As long as the CG is maintained within the allowable limits for its weight, the airplane has adequate longitudinal stability and control. If the CG is too far aft, it is too near the center of lift; the airplane is unstable and difficult to recover from a stall. [Figure 1-2] If the unstable airplane should enter a spin, the spin could become flat making recovery difficult or impossible. If the CG is too far forward, the downward tail load needs to be increased to maintain level flight.This increased tail load has the same effect as carrying additional weight; the aircraft must fly at a higher angle of attack and drag increases. Figure 1-2. If the CG is too far aft at the low stall airspeed, there might not be enough elevator nose-down authority to get the nose down for recovery. A more serious problem caused by the CG being too far forward is the lack of sufficient elevator authority. At low takeoff speeds, the elevator might not produce enough nose-up force to rotate; on landing there may not be enough elevator force to flare the airplane. [Figure 1-3] Both takeoff and landing runs are lengthened if the CG is too far forward. Figure 1-3. 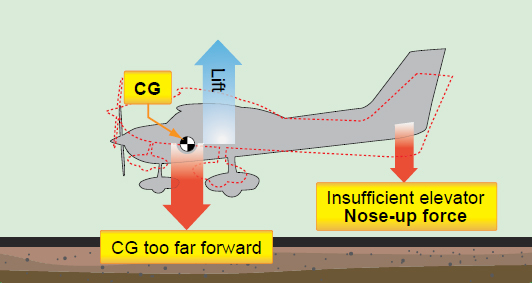 If the CG is too far forward, there is not enough elevator nose-up force to flare the airplane for landing. The basic aircraft design is such that lateral symmetry is assumed to exist. For each item of weight added to the left of the center line of the aircraft (also known as buttock line zero or BL‑0), there is generally an equal weight at a corresponding location on the right. The lateral balance can be upset by uneven fuel loading or burnoff. The position of the lateral CG is not normally computed for an airplane, but the pilot must be aware of the adverse effects that result from a laterally unbalanced condition. [Figure 1-4] This is corrected by using the aileron trim tab until enough fuel has been used from the tank on the heavy side to balance the airplane. The deflected trim tab deflects the aileron to produce additional lift on the heavy side, but it also produces additional drag, and the airplane flies inefficiently. Figure 1-4. Lateral imbalance causes wing heaviness, which may be corrected by deflecting the aileron. The additional lift causes additional drag, and the airplane flies inefficiently. Helicopters are more often affected by lateral imbalance than airplanes. If a helicopter is loaded with heavy occupants and fuel on the same side, it could be out of balance enough to make it unsafe to fly. It is also possible that if external loads are carried in such a position that requires large lateral displacement of the cyclic control to maintain level flight, the fore-and-aft cyclic control effectiveness is limited. Swept-wing airplanes are more critical due to fuel imbalance because as the fuel is used from the outboard tanks, the CG shifts forward. As fuel is used from the inboard tanks, the CG shifts aft. [Figure 1-5] For this reason, fuel-use scheduling in swept-wing airplanes operation is critical. Figure 1-5. 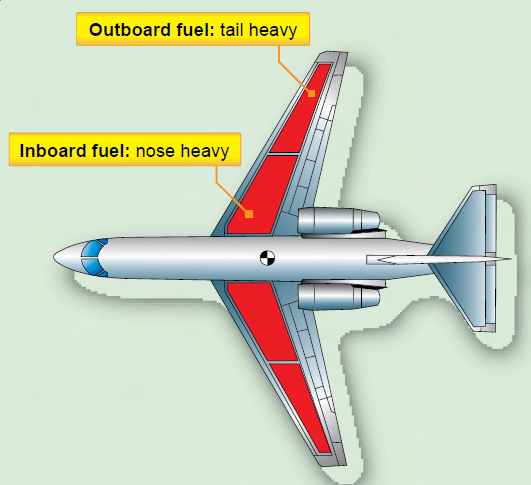 Fuel in the tanks of a swept-wing airplane affects both lateral and longitudinal balance. As fuel is used from an outboard tank, the CG shifts forward.